Group messaging is an effective and inexpensive way to attract new customers to your business, connect with existing customers, and increase sales. It expands on one of the most popular channels of person-to-person communication to help market your goods and services to larger groups of customers simultaneously. One of the major advantages of group MMS Marketing is that practically everybody has a mobile device capable of receiving images, videos and audio files; and 91% of people keep their mobile devices within reach at all times. When you send a group marketing message, your customers will likely read, watch or listen to it wherever they are, whatever they are doing. In addition to being an immediate channel of communication, group messaging is also intimate. It enables a two-way channel of communication between your business and your customers that few other channels of direct marketing can match. Businesses can take advantage of this intimacy to generate engagement, develop brand loyalty, and ultimately increase sales. In order to send group text messages, you need access to a texting platform and a database of customers that have opted in to receive communications from you. This second condition is important: because group messaging is a permission-based activity that is regulated to protect the privacy of your customers and to prevent spamming. Group messaging platforms are web-based applications that you can use from any Internet-enabled device. To access a platform, you register with a group messaging service. The group messaging service provides you with login credentials for its platform and the tools you will need to create a customer database. Access to the database is free. You only pay for the group marketing messages you send. When you are ready to send your first group marketing message, you simply log into the group messaging platform and upload the group(s) of customers you want to receive your message. Then select the multimedia file you want to send, upload the image, video or audio file, and click send. Delivery is nearly instant, and you can monitor delivery rates via the platform's intuitive interface. It is almost certain that you will have seen an advertisement inviting you to text a keyword to a short code number in order to take advantage of a special offer. This is how customer databases are created. When a potential customer sees your advertisement, he or she texts the keyword to the short code number supplied by the group messaging service provider, and they are opted in to receive your group marketing messages. Depending on the nature of your business, you may not want to send every customer in your database every group marketing message. There may be occasions when a promotion is appropriate for some customers, but not for others. Group messaging enables you to sort your database into groups according to your customers´ interests so you only contact each group with relevant messages. You can do this manually, or by assigning different keywords to different product types or services. When a customer texts a specific keyword, they are placed into the appropriate group. This process has the dual advantages of ensuring your customers do not receive too many group marketing messages that are of no interest to them - resulting in opt-outs from your service - and it reduces your marketing costs. Group messaging platforms have plenty of features that can help generate customer engagement and develop brand loyalty. You can run polls and surveys with group messaging to encourage your customers to give their opinions on any number of topics. Many businesses use this feature not only to generate engagement, but also to collect data for future marketing campaigns. Businesses with diverse customer databases can use the extra capacity of group messaging (up to 1,600 characters) to send marketing messages in Unicode, non-standard text - or use the extra capacity to run contests with multiple choice answers. Every reply to your group marketing messages, every vote in a poll, and every contest entry is collected and collated by the group messaging platform. These features not only help generate engagement and develop brand loyalty, but also help expand your database. Research has shown stimulating and topical messages are up to eight times more likely to be shared among friends, families and colleagues on social media - opening the door to an even wider audience and broadening the reach of your business. Engagement and brand awareness alone do not convert into sales. You need to incentivize your customers with a reason to spend money with your business. On-demand coupons are a great way to do this, as customers do not forget their mobile phones when they go shopping as often as they forget to cut a coupon out of a magazine. On-demand coupons have an extraordinary 30%-50% redemption rate. You can increase your customer spend when customers visit your business to redeem their on-demand coupons by offering additional in-store on-demand coupons. Customers simply have to text a different keyword to your short code number in order to take advantage of an additional offer advertised exclusively in-store. In-store, on-demand coupons achieve a redemption rate of 70%-80%. You do not have to worry that, by texting a different keyword to your short code number, the customer will appear in two customer groups. The group messaging platform has mechanisms in place to prevent duplications and to ensure that each customer only receives one copy of each message. It was already mentioned above that group marketing is a regulated activity. Most of the rules applicable to group messaging - including how to protect the privacy of your customers and how frequently you are allowed to send group marketing messages - are contained within the pages of the Telephone Consumer Protection Act 1991 (TCPA). Because TCPA covers so many different channels of communication, the Mobile Marketing Association has extracted the rules and regulations relating to group messaging, and condensed them into a Code of Conduct. We highly recommend that you study this publication before starting your first group messaging campaign. You can get signed up and set up in as little as five minutes. And, we offer support no other provider can (or will) provide. We have helped our customers send over 4 billion messages, and we have learned what works best and what doesn't. 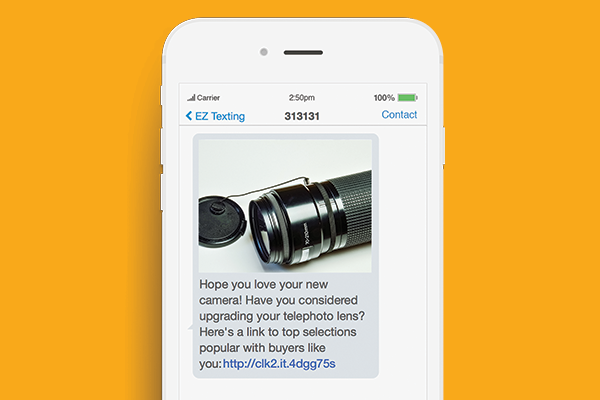 So, if you really want to get started with group messaging, we recommend you talk to one of our "textperts." They will help you get your account set up the right way, and give guidance on how to get the fastest time-to-value from a group text messaging tool.